Today I'm going to explain how you can create medical/hospital edition cards to use with the Headbanz game. Check out my previous Game on! 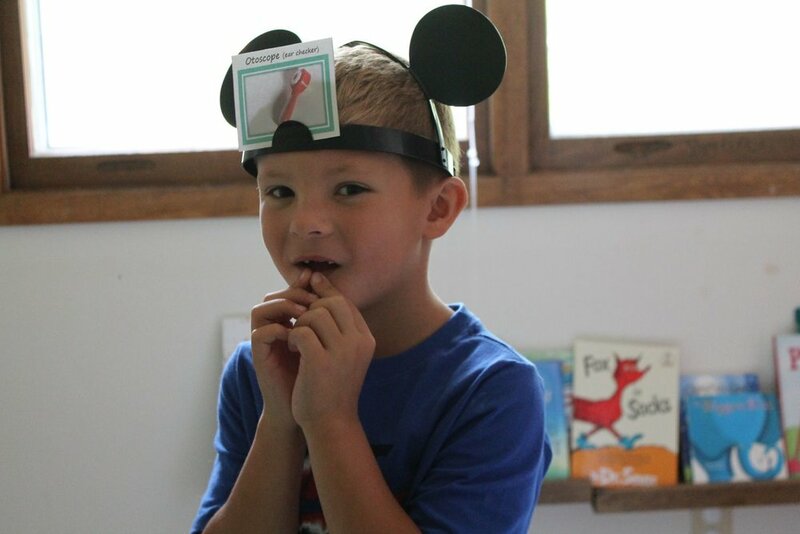 blog post to read about why game playing with a medical theme is a fun way to help children learn and prepare for a visit to the hospital for surgery. 1. Identify medical equipment relevant to the child's experience. If this is your child's first surgery, ask your child's doctor what equipment your child can expect to see and feel the day of surgery. You can also ask your child's nurse, nurse practitioner, or physician's assistant who is familiar with the surgical process at hospital or clinic where the surgery will take place. It's okay to ask them for a contact at the hospital to ensure you have the most accurate information (e.g. will my child need an I.V.?) about what to expect the day of surgery if it is at another location. 2. Take photos of items you might already have at home, draw, or use the handy internet to find images of medical equipment. I am not a professional photographer by any means, but I wanted the images to look nice for you so I taped a large poster board to my fridge and took photos with my DSLR during the middle of the day. This is absolutely not required! Have fun with it and if you have older school-age children or teens who like to draw or use the web in this productive way, invite them to help! This is a great opportunity for siblings to feel included. 3. Input images into a table in a word processing program. Add text label, input photo and add a border if you'd like. 4. Print on card-stock or print on regular printing paper and laminate (as shown below). Cut out cards.